The Ansonia Clock Company was started by Anson G. Phelps on May 7, 1850, in Derby, Connecticut just about nine miles away from its contemporary, the New Haven Clock Company. One of the founders of the company was Theodore Terry, a nephew of the renowned early American clockmaker Eli Terry. Another business partner was Franklin Andrews. Terry and Andrews had previously manufactured clocks under their joint name since 1841. Another brother, Samuel S. Terry also joined the firm. The company began life as a subsidiary of the Ansonia Brass Company, which had already been in existence for some twenty years as a subsidiary of the Phelps Dodge Company. Clocks made during this early period were marked either Ansonia Clock Co. or Ansonia Brass & Clock Co. Unfortunately, only four years later, in 1854, the company manufacturing facility was destroyed by a fire. The parent company, the Ansonia Brass Company and Copper Company, located in Ansonia, Connecticut, continued to make clockworks and a small number of shelf clocks and some ogee clocks as well. It made clocks there from 1854 to 1878. 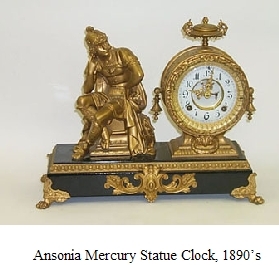 Some of the clocks of this interim period were marked as Ansonia Brass & Battery Co. The company was re-formed in 1878 with the original name and moved to Brooklyn NY. Unfortunately, fire destroyed their new location almost immediately, in October, 1880, the second year of operation. Meanwhile part of the inventory was still being produced in Ansonia until 1883 when the rebuilt plant in Brooklyn went into operation. This was a time of rapid growth for the company. It opened sales offices in New York, Chicago, and London. They produced a large line of mostly wall clocks and mantel clocks . In addition to those popular types, they started producing the novelty, and figurine clocks that became so popular. By 1919, the company had sales agents in Austrailia, New Zeland, Japan, China, and India. Ansonia became one of the largest clock and watch exporters in the country. It started a line of non-jeweled watches in 1904, to take advantage of the exploding dollar watch industry. After World War I, sales for the company started to fall off quickly and was sold to Moscow, Russia in 1929. However, the trademark and name were reborn once again in 1969 as the Ansonia Clock Company of Lynwood, Washington. The revived Company sold imported clocks under the Ansonia trademark until December 31, 2006 when it closed its doors. However, the Ansonia Clock Company of the 1800’s and early 1900’s has left us a wealth of lovely upscale shelf clocks. They produced elegant statue clocks in a continental style that appealed to upscale businessmen who owned the large Victorian homes of the time. The company was also known for its production of iron-cased clocks which were displayed at the 1853 New York World’s Fair. Many of the iron-front clocks were embellished with mother-of-pearl inlays which were decorated with ornate gold leaf designs. Unfortunately, with wear and age, it is difficult to appreciate the impact that the design of these unusual clocks had. Some places you may find them today are antique or collectibles stores, flee markets or yard sales, trade shows, auctions, estate sales or from clock shops. 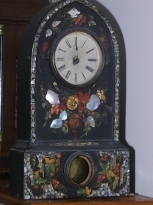 One of the best places to find all kinds of antique, or collectible clocks is on eBay. They have thousands of listings every day where you may find just the clock you're looking for. Find a great Ansonia Clock on eBay here. See what is available right now.